I don't know if you've noticed or not... Your comments used to post immediately, but now they have to be moderated. 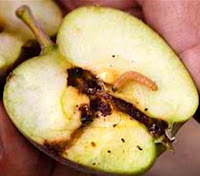 Seems a few bad apples spoiled the bunch again. Yep, those spammers got me really annoyed! When I'd read the comments to my posts, there would also be some ad for a male enhancement prescription. Do they really stir up business this way? It started out with an occasional ad, but now it's gotten to be a daily thing. They've hit all three blogs! And it's not just the male enhancement products anymore. Everything from thyroid medicine to arthritis drugs have been linked to in my comments. So I'm pulling the plug. Note: Anonymous friends, please feel free to e-mail your comments to me. I've had a spam problem too and that is why I use comment moderation. I even blocked my email address when they found it on my profile and started using it too. Oh that's awful. Some people have nothing better to do with their time, I guess! Like you said, would a random ad for enhancement products or whatever actually get someone to click on it? Good grief. Sorry to hear you've been hit by this. Yes, I noticed that now you moderate your comments. I suppose it's where we are all headed... sheesh. I am interested in your essays blog now, since I'm in the process of starting one myself. I want to write longer posts than I feel comfortable doing on D-Jan-ity. I'll let you know when I've got anything worthwhile on there! I've moderated comments from the start, and it's helped keep spammers away. I hope this solves your problem. Sad. I've been thinking of taking off the moderation, but after reading this, I'll leave it on. Lily,how disgusting.I moderate mine too,it's the best way and your quite right in pulling the plug. Blogging should be stress free...some spoil the fun.Hope things get better and hope your feeling well again.Always block annonymous comments,turn on your spam filters for email too. Lily,if you turn on the word verification in comments settings,no automated comments will reach you and others will not waste their time.It works for me. Love your cartoon. 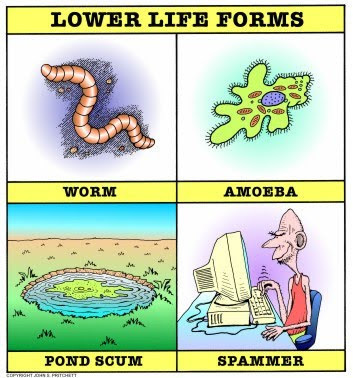 I, also, see spammers right next to pond scum. Good choice in blocking them. I love Marla's comment, but hate your anonymous spammers. I've had a few recently, but they always show up on old posts and I delete them as soon as I receive the email it posted. I figure if it continues, I will do the same thing you have. Hope they've gotten the hint though. Do they really think our readers will click on their links? Idiots! I just don't know what the reason is for spammers to do stuff like that. Don't they have better things to do?